“A boy’s best friend is his mother.” For Norman Bates, that statement took on a little more weight than maybe it should have. One of the most iconic characters in American cinema is Alfred Hitchcock’s murderous man with mommy issues, as brought to life by Anthony Perkins in Psycho. (And again, to diminishing returns, in Psycho II, III, and Psycho IV: The Beginning.) A film lauded for numerous reasons, most of which have to do with the masterful direction of this pulpy little tale, it also helped solidify a new trope of movies: The split-personality villain, who has popped up time and again since that early incarnation, most recently in M. Night Shyamalan’s delightfully wicked Split. But the original Norman is still the most potent of these monsters, and for the past four seasons, A&E’s Bates Motel has delved into his history, tracing the development of the young Norman Bates from troubled teenager to fully-formed killer, all under the obsessively watchful eye of his tragic mother, Norma. Fans have savored the operatic tenor of this little-seen show, and finally saw it rewarded with a probably-meaningless-but-still-justly-deserved triptych of People’s Choice Awards this past year. But as it gets ready to air its fifth and final season, an ironic twist is in store for those who have never treated themselves to this demented delight (certainly more of a twist than the news that Norman’s mother’s body—spoiler alert for a 57-year-old movie—ends up slowly decomposing in the basement): The last season is actually a perfect opportunity for new viewers to begin watching. When Bates Motel was first announced, attitudes toward the show were decidedly skeptical, including our own. The origin story of a man who splits his time between his own personality and the construct of his dead mother looked like a dire and creatively bankrupt proposition, something more likely to wind up in the graveyard of bad serial-killer prequels, alongside Hannibal Rising and Exorcist: The Beginning. Instead, it took what began as a fatal weakness—lurid and over-the-top camp—and turned it into the biggest strength of the show. 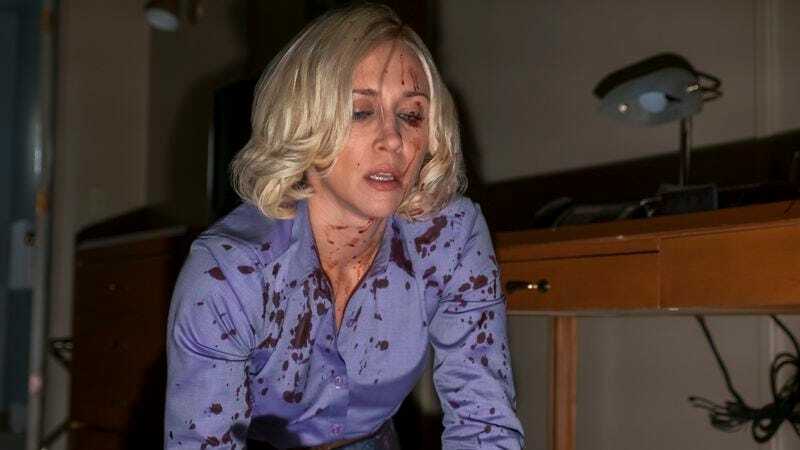 Make no mistake: A large portion of the credit here should go to Vera Farmiga, whose scenery-chewing, otherworldly role as Norma Bates is perhaps the single most purely enjoyable and fascinating performance from the past half-decade of television. It’s rare to see a single actor burn so brightly, and on such a different register, that she literally forces every other actor, and the entire creative team behind the camera, to rise to the occasion of meeting her on a wholly different artistic plane than was perhaps originally envisioned. The show’s uneven first season often threatened to turn into a turgid soap opera, marred by characters who weren’t working and dour narrative gambits that led into dead ends. But Farmiga’s combination of arch camp and character-actor intensity pulled everything around it into her orbit, and by season two, the show had clearly been rejiggered to take into account the tone and style she was setting for it. Showrunner Kerry Ehrin smartly cast off everything that didn’t work and homed in on playing to the gonzo nature of the material, while still making sure to craft stories with heart and emotional resonance. Not everything worked, but the series gradually evolved into a sharp and idiosyncratic wonder, not to mention turning Freddie Highmore into a soulful actor actually capable of going toe-to-toe with heavy hitters like Farmiga and Nestor Carbonell. The show has played out like a Greek tragedy, with each season gaining power from the audience’s knowledge of the sad fate ultimately awaiting its protagonists. Knowing what was in store became an asset rather than a liability, lending pathos to both Norman’s and Norma’s struggles to do the right thing, to be good people, to resist the irresistible end to their tale. Season one established the relationships, setting up this idealistic but emotionally damaged mother-son team in an unwelcoming new town, and reintroducing their estranged son and brother, Dylan, to the family, all while setting up the existence of Norman’s blackouts. Season two created new romantic interests for the Bates family members, as well as establishing the murderous potential of Norman—along with a hell of a messy family reunion in the form of Norma’s brother, Caleb. In seasons three and four, the bodies began to pile up as Norma and her son tried to conceal each others’ crimes and behavior from the outside world, their codependent relationship eventually leading to Norman’s institutionalization. But it was always doomed to fail, and last season ended with the death of Norma via Norman’s attempted murder-suicide plan, his own death thwarted by Norma’s lover and husband, Sheriff Alex Romero (Carbonell). But four seasons of dramatic intrigue brings us to the present—and the final season of Bates Motel is the best place to pick up the story of Norman Bates since the pilot. We’re now up to the point in the story where everyone is familiar with the contours of Norman’s life. He’s owner and manager of the motel, living alone in that big house, but with a fractured psyche. He’s convinced himself that he helped Norma fake her death, and she has to stay inside at all times to avoid detection. This accounts for his delusions when he’s with “her” as well as justifying how he’s able to discuss Norma in the past tense with everyone else. The extensive backstories of people like Dylan, his girlfriend Emma, and Caleb are referenced with short but simple scenes, allowing those who have seen the past seasons to appreciate the depth of the relationships while not bogging down new viewers in needless exposition. Rarely do serialized shows in their final acts allow such accessible entry points. The chance to watch a bold and unusual take on the swan song of one of America’s classic fictional serial-killer ghouls should be an appealing thought for those who haven’t followed the show, buoyed as it is by positive critical word of mouth for what’s come before. A final incentive for curious onlookers comes in the form of Rihanna, who joins the show for its final season as the famous Marion Crane, the role that netted Janet Leigh a Best Supporting Actress nomination and possibly the most iconic death scene in film history. If it seems crazy to join a rich and weighty thriller in its final arc, remember it’s not really that strange—we all go a little mad sometimes.